A large number of unfit, unregistered and rundown human haulers are plying with unlicensed teenage drivers on different busy streets in the capital, putting the lives of pedestrians and passengers in danger. According to the Bangladesh Road Transport Authority (BRTA) data, over 4,500 human haulers are operating on different routes in the capital. These young unlicensed drivers are particularly prone to high-risk behaviours, including impaired driving and speeding. These drivers are seen driving small-sized human haulers on different streets without any institutional driving lessons or knowledge of the traffic rules, exposing the city dwellers to high risk of fatal accidents. During visits to different busy streets recently, the daily sun correspondent saw students of Agargaon Sher-e Bangla Boys’ High School and Ganabhaban Government High School travelling on these risky vehicles plying between Agargaon and Mirpur-10. Juveniles are driving such rundown four-wheelers in Farmgate, New Market, Pilkhana BDR gate, Mohammadpur, Mirpur, Gulshan, Mohakhali, Khilgaon, Banasree and Gabtoli areas as well. “We have to travel by these human haulers regularly as there is a severe shortage of public transports,” said Asab Hossain, a student. “Passengers are being compelled to make these risky travels due to shortage of public transports in many routes of the capital,” said Ratna Khanom, a banker who lives in Mirpur-10. Sources said dishonest owners and inexperienced drivers are running these dilapidated vehicles, managing a section of policemen and local crooks. Most of the roads in Mirpur, Mohammadpur, Gabtoli, Azimpur, Khilgaon, Bashabo, Mugda, Malibagh, Agargaon and Jatrabari areas are jam-packed with human haulers. Due to a shortage of passenger buses, many middle-income residents have no option other than to get into such the worn-out vehicles. Engines of most of the vehicles often backfire or break down and passengers are compelled to get down far away from their destinations. The drivers are very unskilled and unlicensed and often cause traffic accidents. In most cases, these human haulers are characterised by broken windshields, torn seats and damaged metal bodies. 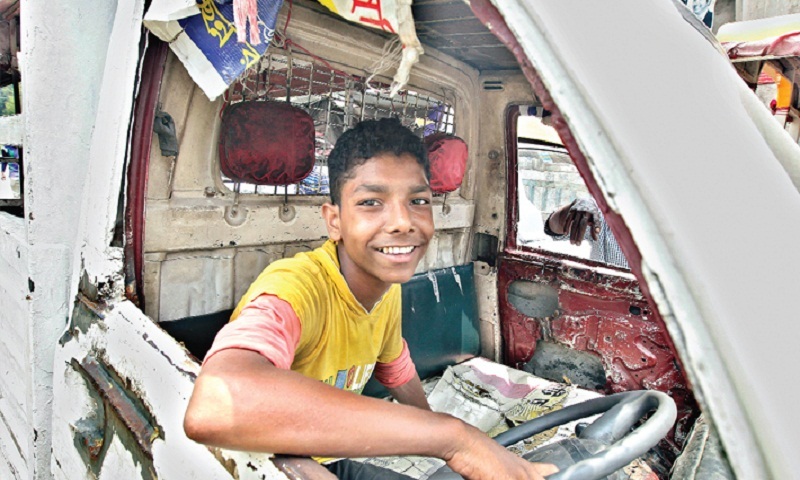 While talking to the correspondent, several underage drivers said they learnt driving from senior drivers while working as helpers in human haulers. He said he started driving after working as a helper for two years, adding that most of the drivers working on this route do not have any genuine driving license. “You don’t need a driving license to drive human hauler, the only thing you will need is bravery,” the desperate teenager claimed. Kamrunnahar, a banker, said she uses human haulers for short-distance rides as those are risky for passengers. Ehsan Hossain, a resident of Mirpur area, said some passengers like taking human haulers for short trips to avoid hassles though these small vehicles are the main cause of traffic jams. “At Mirpur-10 traffic roundabout, we have to wait for about half an hour during busy hours as human haulers continue to make U-turns,” he said. There are allegations that traffic sergeants allow at least a dozen human haulers to use the crossing as their stoppage. Under Khilgaon Flyover, a chaotic situation always prevails as human haulers do not go by traffic rules. They sometimes cross the railway crossing even, ignoring traffic signals and putting passengers’ lives at risk. Alongside human haulers, a large number of motor-rickshaws are also plying in the city streets. The number of the rickshaws is around 20,000. Experts said easy financing is largely responsible for the entry of a large number of human haulers into the city’s traffic system. “If any motor vehicle is found plying the roads without a fitness certificate, tougher action will be taken,” he added. The BRTA data showed that a total of 87,795 unfit motor vehicles, including human haulers, are currently operating in Dhaka.